RESCUE HOVERCRAFT | European hovercraft manufacturer. Rescue services recognise that hovercraft as a key tool to any search and rescue operation in areas where conventional rescue boats and vehicles cannot reach. There are many tidal areas where boats go around or areas where people become marooned by floods or where people fall through ice. With a Eurohover Rescue hovercraft these areas are now safely and easily accessible – saving lives. Hovercraft is the only rescue vehicle able to perform fast, safe rescue operations on swift water, thin or broken ice, flood waters and snow. Because it safely hovers 20 cm above the terrain, a hovercraft keeps the rescue team above the danger – not in it – and gives rescuers access to areas a boat or helicopter cannot reach. In order to get medical clinic and supplies to some of the remotest and inaccessible corners of the globe, the hovercraft can be the only solution. Our hovercraft offer clean, secure and spacious cabins which can be kitted out with the latest medical equipment to suit your requirements to form ideal mobile medical clinics. For rescue purposes we usualy recomend hovercraft models which can take from 3 to 5 passangers. 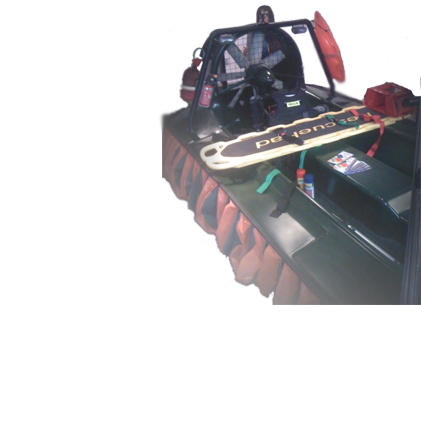 We also produce hovercraft to carry on much more load on commercial order.